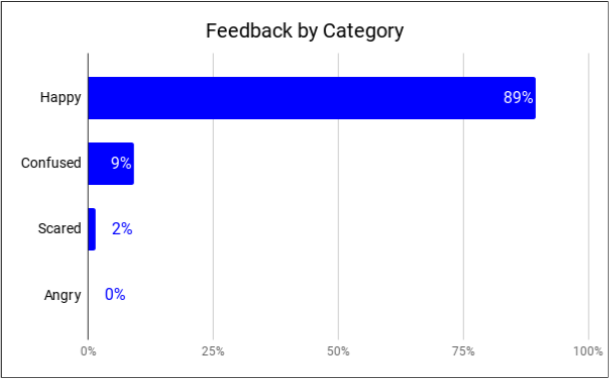 To provide structured feedback the following request was made: “Please circle the word or words (max 3) that best describe(s) how the presentation leaves you feeling.” The following graphic provides a visual representation of this feedback. See note 1 for the data used for the graphic. The feedback was summarized under the categories of Happy, Confused, Scared and Angry. Security No one wants to negatively impact the safety and security of residents and visitors (students, employees, etc.) to University Heights. Understanding potential security issues such an undertaking could introduce or exacerbate is very important. Steps to mitigate potential issues will have to be part of the development of any forest garden in University Heights that I am involved with. Funding My expectation, as expressed at the annual general meeting, is that this forest garden will be mostly built with labor and funding from outside the community. This will require a detailed project plan and well articulated design documentation to support credible external funding requests. Confusion about “community garden” Most people hearing “community garden” think about some raised garden boxes, typically beside a community building or shed that houses tools and a water source--at least I know I did. I call this a traditional community garden. In researching the idea of a community garden for University Heights I realized there are also “non-traditional” community gardens. Gardens can serve a variety of purposes besides individuals/families growing vegetables; such as healing (The Children’s Hospital has gardens primarily to facilitate healing), education (Parkdale’s edible forest located at their community centre) and community beautification (Silver Spring’s botanical garden.) 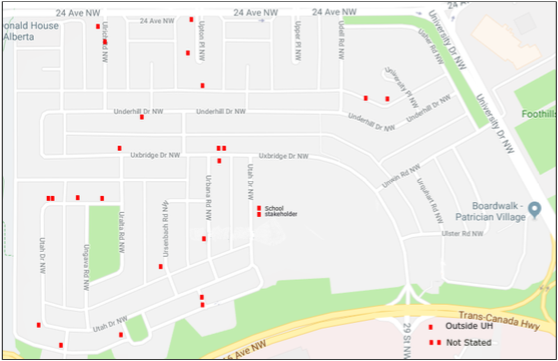 These gardens are all included in the Community Gardens database maintained by the Calgary Horticultural Society. 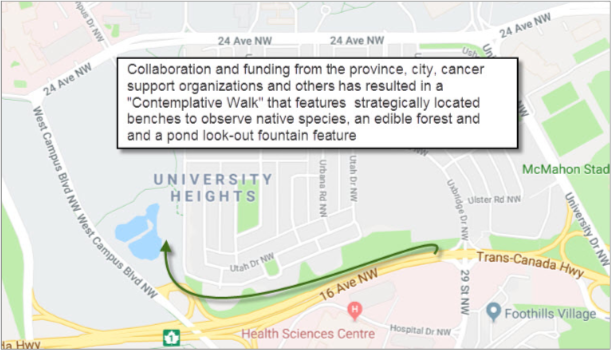 University Heights is uniquely situated by the Calgary Cancer Centre and I want to engage committed community members in the exploration and possible development of a “Contemplative Pathway” as described at the start of this document. I would classify this as a non-traditional garden which could benefit the community. How? When I think optimistically about the possibilities, I see the potential for a beautiful pathway, better lighting, making the green space adjacent to 16th avenue more resistant to change, contributing to the quality of patient care (and of their families), providing learning opportunities for students at University School and Westmount Charter Mid-High school, and aeration of the University District pond. Some communities have both traditional and non-traditional components of their community garden; Parkdale, for example. If someone would like to lead the implementation of a traditional community garden I invite them to work with me so that we can produce a co-ordinated proposal for the University Heights Community Association executive. 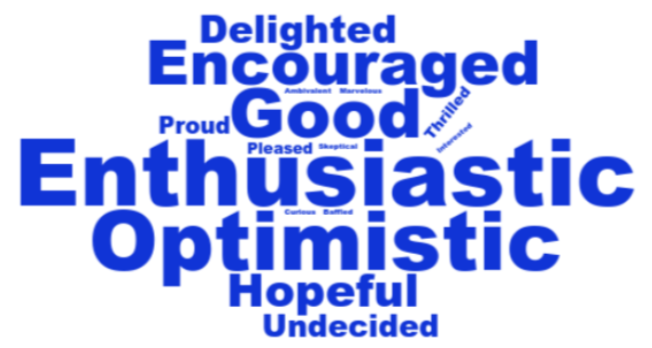 Data: Enthusiastic (12), Optimistic (11), Good (9), Encouraged (8), Hopeful (6), Delighted (5), Undecided (4), Proud (3), Pleased (2), Thrilled (2), Ambivalent (1), Baffled (1), Curious (1), Interested (1), Marvelous (1), Skeptical (1), Anxious (0), Aggravated (0), Alarmed (0), Apathetic (0), Bad (0), Depressed (0), Discouraged (0), Displeased (0), Distraught (0), Fearful (0), Mad (0), Satisfied (0). Two feelings (curious and interested) were written in (each by one respondent) and are excluded from the following analysis.The remaining 26 feeling descriptors (see Note 1) can be categorized under the headings of happy (11), and not happy (15) [angry (3), confused (3), sad (5) or scared (4)]. The following graph’s blue bars represent the number of times feeling descriptors in each category were selected versus the total number of all items selected (66). For example, 59 of the 66 total items selected were in the Happy category.